Is UC Berkeley's Plan to Cut Down 54,000 Trees Necessary? A respected environmental contractor has questioned the university's controversial fire-prevention proposal and contends that it could create a new fire hazard. Some parts of Claremont Canyon are covered with blue gum eucalyptus. UC Berkeley has stated that its plan to cut down all blue gum eucalyptus, Monterey pine, and acacia trees in a section of the East Bay hills is the best method for preventing a catastrophic wildfire. But the proposal to cut down 54,000 nonnative trees on about 284 acres in Claremont and Strawberry canyons and a connecting ridge has drawn fierce criticism from residents, most notably a group called the Hills Conservation Network. A MoveOn petition that the group started had gathered some 4,700 signatures as of press time. Yet UC has largely dismissed these opponents as a vocal minority that is simply against cutting trees. However, a letter obtained by the Express that was written by a respected environmental engineering company challenges several aspects of UC Berkeley's plan. The letter from URS Corporation, which regularly contracts with numerous public agencies and was initially hired to be a consultant on the tree-cutting project, even questions whether UC Berkeley's proposal poses its own fire risk. In addition, the East Bay Regional Park District is proposing a much less-drastic project than UC Berkeley. 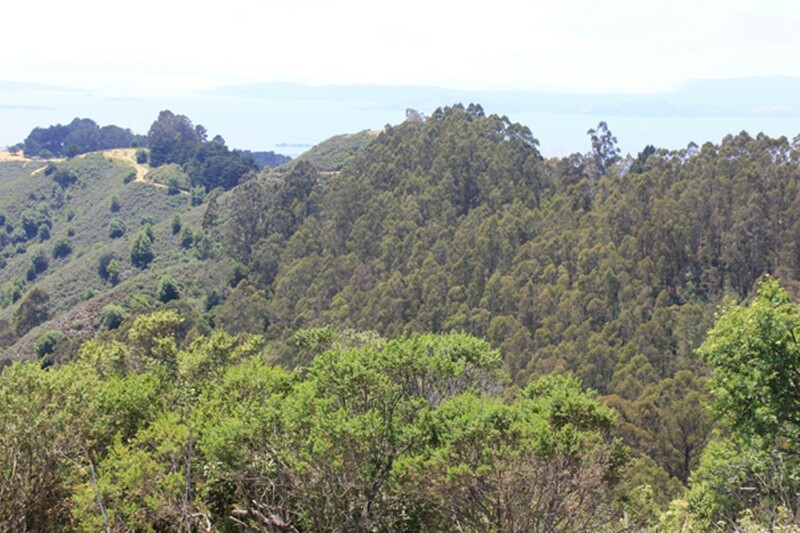 The park district is proposing to do "selective thinning" on its land in the East Bay hills, along with the removal of some (but not all) nonnative trees. The stark difference between the park district's plan and that of UC Berkeley, coupled with the letter by URS Corporation, raises questions as to whether UC's plan to cut down all nonnative trees in Claremont and Strawberry canyons is necessary. According to the letter from URS Corporation, the method of thinning and regularly clearing the understory (which is being used by the park district) was not chosen by UC because of "increased costs and a longer time period to implement." Although the letter stated that thinning and regularly clearing understory (defined as smaller trees and bark) would not be as effective overall at preventing fires as cutting down all the eucalyptus, it "would reduce the fire hazard and would thus meet the purpose and need" of the project. In other words, thinning and clearing would be sufficient to lessen the fire risk in the East Bay hills. The letter goes on to question the need to cut down all the Monterey pine and acacia trees, stating, "UC inaccurately characterizes the fire hazard risk posed by the two species. ... Monterey pine and acacia trees in the treatment area only pose a substantial fire danger when growing within a eucalyptus forest." Furthermore, the letter wondered whether UC Berkeley's proposal would actually create a new fire hazard. That's because UC wants to spread chips of the cut trees up to two feet in depth in 20 percent of the project area as a way to prevent nonnatives from growing back and to prevent fires. While acknowledging the fire hazard of eucalyptus trees due to their "high fuel loads in the canopy and on the ground" (because of their shedding bark), the letter noted, "the comparative risk between eucalyptus in the form of a dense standing forest versus the form of a 2-foot-deep mulch layer on the ground is not well documented. Studies have shown that mulch layers actually can pose a fire risk depending upon the type of material, the depth of the mulch, and the climate at the mulch site." It goes on to state that mulches high in oils (as eucalyptus mulch would be) ignite more easily, and that mulch fires in a hot, dry climate (such as that of the East Bay hills) start more readily. URS Corp recommended a mulch layer of "less than 4 inches ... to avoid spontaneous combustion." East Bay Regional Park District proposes only leaving wood chips at a depth of four to six inches in its plan. The park district, along with UC Berkeley and the City of Oakland, applied for the $5.6 million FEMA grant for fire hazard reduction on a total of about 1,000 acres in the East Bay Hills. In all, the public agencies plan to cut down more than 80,000 trees. Because of the grant application, FEMA is now leading the environmental review process. According to the letter from URS Corp, UC Berkeley contends that the concern of embers being generated at the site of wood chips is negated in the absence of a canopy. But because UC is removing only nonnative trees, native species such as California bay and coast live oak would remain in the canyons. "Although the fire risk of bay and coast live oak is lower than eucalyptus, the misleading statement about an absent canopy undermines the argument that the risk of embers is eliminated," URS Corp stated. The remaining vegetation on UC's land would also affect the fire hazard. And URS Corp strongly questioned UC's assumptions about the types of plants and trees that would remain after the proposed clearing. URS Corp noted that there are two types of fires: climate-driven fires and fuel-driven fires. While the removal of eucalyptus, in particular, would reduce the risk of catastrophic fires driven by climate conditions in the area, the risk of fuel-driven fires is unknown. That's because URS Corp believes that because UC has no plans for re-planting the area, all different types of vegetation may sprout up after the project is completed, including native and nonnative grasslands, chaparral, nonnative shrub/scrub communities, and oak-bay forests. And each one of those vegetation types carry with it different fire conditions. For example, "a chaparral-dominated landscape in the post-treatment project area would create a fire hazard profile with its own suite of risks and concerns for fire protection ...," stated URS. 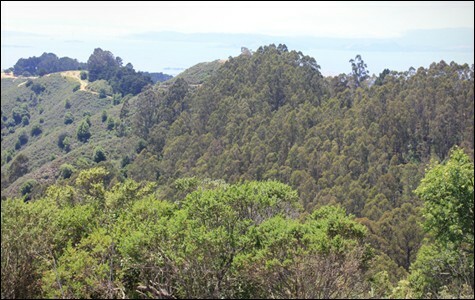 Representatives from UC Berkeley have said that native vegetation — California bay laurel, oak, big-leaf maple, California buckeye, California hazelnut, and others — will naturally return once the eucalyptus is removed, as seeds currently beneath the nonnative trees aren't allowed to grow due to the toxic oils in eucalyptus leaf and branch litter. As evidence, the university has cited native plant recovery in past tree-removal areas in Claremont Canyon. But URS Corp's letter challenged those notions as well. "[W]e question the assumption that the types of vegetation recolonizing the area would be native. Based on conditions observed during site visits in April 2009, current understory species such as English ivy, acacia, vinca sp., French broom, and Himalayan blackberry would likely be the first to recover and recolonize newly disturbed areas once the eucalyptus removal is complete. These understory species are aggressive exotics, and in the absence of proactive removal there is no evidence to suggest that they would cease to thrive in the area ...."
And URS Corp also wondered whether the use of wood chips would actually prevent the growth of nonnatives, as UC asserts. "Despite thorough research, we were unable to find documentation of the ability of exotic chip mulch to suppress undesirable species while encouraging favorable species," the letters stated. "Chip mulch can be a successful deterrent to invasive plants, but would have to be coupled with selective native plantings if the intended long-term outcome was revegetation in native cover." Tom Klatt, UC Berkeley's Environmental Projects Manager, who has guided UC's effort, declined to comment on the 2009 letter from URS Corporation or the issues raised in it, and added that he wasn't aware of its existence, although he said he has had to respond to numerous questions from FEMA throughout the project process. URS Corporation was a consultant during the initial environmental assessment of UC's application, but was not retained to complete the full environmental review. FEMA spokeswoman Mary Simms declined to respond to questions about why URS was not retained. It also appears that few, if any, of the issues addressed in the company's letter were taken into consideration for FEMA's draft environmental impact statement on the tree-removal plan. In an interview, Klatt defended UC's plan, saying it was necessary to cut down all the eucalyptus in the area because the tree is a "fierce propagator." "Unless you eliminate the seed source, these fast-growing invasive plants will always dominate," he said. "Part of the goal of making this work permanently is to remove this plant, not manage it into perpetuity." But some critics contend that UC Berkeley's true motive for cutting down so many trees is not fire suppression. Dan Grassetti of the Hills Conservation Network believes UC's project is being driven by a native-plant agenda. "There's an alliance here between UC and the native plant community," he said, referring to the Claremont Canyon Conservancy, a nonprofit homeowners' group that supports UC's plan, has worked with UC on the FEMA grant, and is strong proponent of restoring the area's native vegetation. "If you didn't have ulterior motives, you wouldn't do this." Three years ago, Grassetti's group sued the park district over its then-plan to chop down more than 500,000 trees. The two parties settled a year later, and Grassetti said that, as a result, the park district agreed to thinning and understory removal, as opposed to clear-cutting. So now, UC Berkeley's plan to remove all eucalyptus, Monterey pine, and acacia stands in stark contrast to the park district's plan. In an interview, park district fire Captain Brad Gallup said the agency's fuel reduction techniques of thinning brush and surface fuels, as well as the removal of some nonnative trees, are necessary to achieve a "more fire-safe landscape." So could UC thin its trees and manage the understory as the park district proposes to do and still meet the goal of fire safety? Scott Stephens, a professor of fire science at UC Berkeley who's a member of the campus' Urban Interface Committee, which provided advice to Klatt but was not involved in the FEMA project, said both methods are acceptable for fire safety, but that cutting down all the trees is cheaper. "Berkeley doesn't have the resources to implement a two-, three-, four-year rotation [to remove eucalyptus seedlings]," he said. "That's a real expense." FEMA's draft environmental impact statement also acknowledges the financial considerations, noting that repeated removal of ladder fuels is expensive. It also states that it can be difficult to do on the steep slopes that are common in the proposed areas, and can lead to erosion. But critics of UC's plan believe still another factor may be involved in the university's decision to cut down, rather than thin, all nonnative trees: development. As the draft environmental impact statement notes, UC's 2020 Long Range Development Plan includes the possibility of building faculty housing and a campus retreat center at its Claremont Canyon Regional Preserve study area. But Klatt strongly denied that either a native-plant agenda or the prospect of new development was driving the plan. "We are not removing these trees for future development," he said. "Frankly, if we wanted to develop the area, why would we turn it into a pristine native forest?" Yet Klatt also acknowledged that the university's long-range plan calls for 100,000 square feet of expansion in the hills. As other news outlets have noted, opponents to the FEMA plan also take issue with the use of herbicides that will be used on cut eucalyptus stumps to prevent regrowth, and in the loss of habitat for raptors, which nest in the tall trees. Grassetti of the Hills Conservation Network said it's unclear what effects herbicide use will have on habitat, and it's possible that rodents may become a problem in the absence of hawks and owls that live in the trees that are to be cut down. There's also the concern that cutting down all nonnative trees will leave a partially barren landscape, and thereby diminish the aesthetic value of the canyons, which is used extensively by many hikers, walkers, and joggers. But Grassetti is most concerned about the plan achieving its original goal: "If all is said and done and we didn't improve the fire risk, that would be a travesty," he said, adding that if FEMA does not address his group's concerns and amend the final EIS, his group will file a lawsuit. UC Berkeley's ongoing fire mitigation plans are dramatically changing the hills landscape, as conflicts have erupted among neighbors.